The rumors about Amazon's entry into the game console/set-top box gained a ton of credibility this morning, as shots of a gamepad bearing the online giant's logo hit the web. Seen on The Verge, the images come from Anatel, a regulatory division of the Brazilian government analogous to the FCC in the U.S. With a blocky design reminiscent of the OnLive controller, the Amazon gamepad features what look like home, back and menu button, along with a dedicated input for the company's GameCircle storefront. Amazon has yet to officially comment on the living-room-aimed, Android-powered hardware that they're supposedly building. They bought game development studio Double Helix last month, calling the acquisition " part of our ongoing commitment to build innovative games for customers." Keep in mind this might not be a final design for the gamepad. 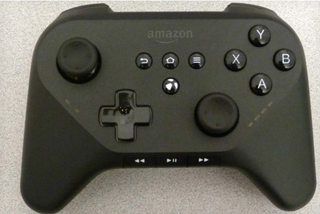 We've reached out to Amazon about the game controller images and will update this story if they respond.